Everyone considers their home a sacred place where they can unwind and relax after a long day at work, which is why it needs to be filled with positive energy flow. Feng Shui is an ancient Chinese art of balance and arrangement that strives to provide maximum energy flow and bring peace and serenity within your home. The method of arranging items can help you feel better and will get rid of the negative energy in your home. Feng Shui suggests that everything in your home needs to be in a designated space – if something doesn’t belong in a spot, it shouldn’t be there. Shoes should be nicely tucked away, the keys shouldn’t be randomly thrown on the kitchen counter and other items should sit in a designated spot. Putting items randomly in your living room will only hurt the energy flow and create additional problems. We bet that there are things in your home you don’t use, yet they are still occupying a spot in your rooms. Don’t let them take a spot if you don’t use them – remove them from their spots and let the energy flow! When you enter your home, everything needs to be organized and in its place. There shouldn’t be a pile of shoes on your front entrance or coats that can’t be hanged. Maximize your storage options to keep an organized front entrance in order to have proper energy flow in your home. According to Feng Shui, you should pay special attention to your bedroom as it is the place where you recharge your body. Items under the bed are blocking the energy flow in this room, so you need to throw them away. The bedroom is a sacred place so try to keep it that way. Mirrors are fine as long as they are in the right place. Put them in a place where they reflect clutter, however, and they will block proper energy flow. They shouldn’t be placed in the bedroom as well – according to Feng Shui, this means that someone else may intrude your love life. If you put flowers and plants in your home, you need to take proper care of them. 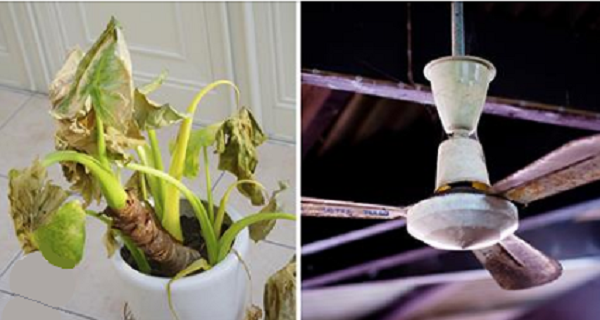 Dead plants and flowers don’t just look ugly; they also reflect a dead energy and should be thrown away. If something’s broken in your home, you need to fix it. If you don’t intend to, throw it away. Feng Shui says that broken items harm the proper energy flow in your home, so it’s time to throw these items out. Having a bed bordered by walls on one or more sides is just plain wrong for the energy in your home. Positioning your bed in another way will promote proper energy flow and help you sleep better overnight. Don’t put a bed against the wall – if you have to, at least keep it limited to one wall. Items over your bed such as lighting fixtures and ceiling fans hurt the energy flow in your home just as much as items under your bed. Ceiling fans chop up energy, while light fixtures should never be put over a bed. Put them in a different spot and you will greatly benefit from it. Feng Shui considers the bedroom a yin space, which means that it’s a place of relaxation. As a calm spot, everything in the bedroom needs to be in its place and fully functional, including paint color. You should avoid putting electronic devices in the bedroom as they will disrupt the energy flow and won’t let you sleep. Try including these tips in your lifestyle and you’ll make your home an oasis of positive energy!